Learn more about how to add or edit custom fonts with Listrak's Font Manager. Stay on-brand and take your email design to the next level with the ability to easily add your own fonts to Listrak Composer from Google Fonts, Typography.com, and Adobe Fonts. 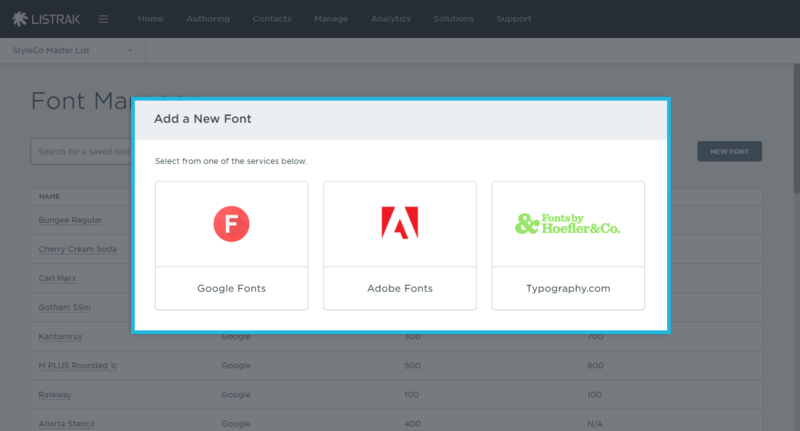 Now you can easily add or edit your portfolio of fonts using Listrak's Font Manager. Access the Font Manager by following the below steps. Go to Content and Media. 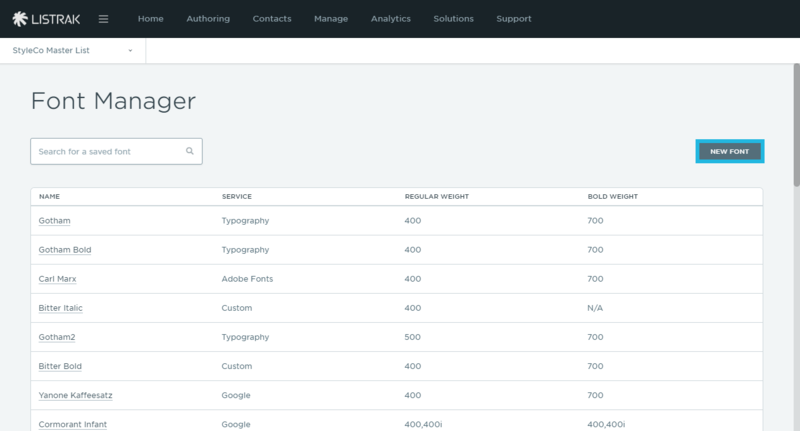 You will land on the Font Manager dashboard, where you'll see an at-a-glance view of your fonts, their service, and styles. 1. Click New Font in the upper right-hand corner. 2. Select a new font (Google, Typography, or Adobe Fonts). Depending on which font you select in step two, be sure to follow the specific instructions for each font type outlined here. These instructions walk through the steps that are required to set up accounts with each of these font services and the applicable information that is needed from each. Be sure to follow the steps outlined to seamlessly add them into the Font Manager. 1. Search for the applicable Google Font. 2. Select the applicable font weights (regular and bold). Create many different font variations using different weights. 3. Click the checkbox to include italic styles. NOTE: Including italic styles increases the file size and load time. 4. Update the fallback fonts, if applicable. Be sure the first font in the stack is the font family you're adding. NOTE: Some of the above styling options may vary based on the Google Font that's selected. TIP: Use the same font with different styling and weights applied to create different custom fonts. For example, when using Roboto, create Roboto-Regular with weights of 400 and 700. Then, create a second version of Roboto called Roboto-Light with weights of 100 and 500. 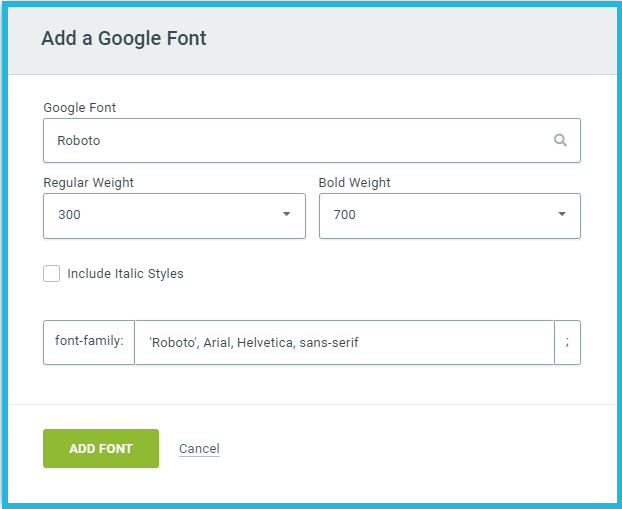 Check out Google Font Customizations to begin - the font possibilities are endless! 1. Enter the Project ID. 2. Enter a Font Name. 3. Add the font family as the first font in your stack. 4. Update the fallback fonts, if applicable. TIP: When setting up your project, ONLY select the font weights and styles that you intend to use for regular, regular italic, bold, and bold italic. These are the only weight and style controls available in Composer text components. To set up more weights and styles, create another project and select the alternate weights. 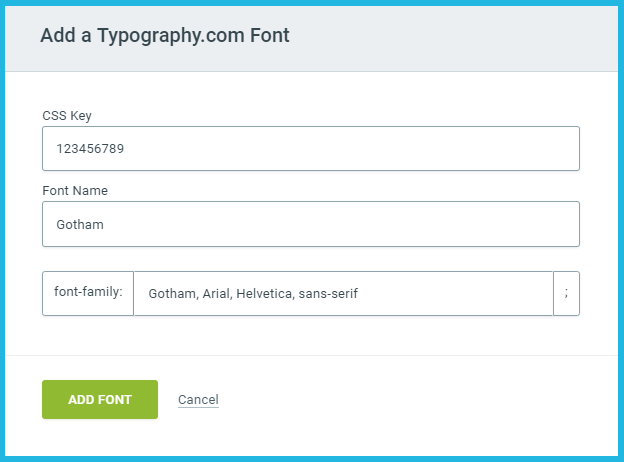 Then, create a new font in Listrak's Font Manager with a new name. 1. Enter the CSS Key URL. NOTE: Only enter the URL of the CSS Key, not the entire <link> key. Please use the key format of: 1234/5678/css/fonts.css. Be sure to use OpenType, TrueType, and Web Open Format fonts for the best browser support. Many popular fonts have already been added to your account by default. No further action is required to use these fonts. You can not delete a font. This prevents deleting a font when the font may be in use for a message. Please contact the Listrak Client Success Team for assistance on removing a font. After a font has been added, edit options are relative to the font. For example, edit the styling of a font. You must have Author-level access to view the Font Manager. Learn more about Listrak's permission levels here. Please do not include more than one space when naming fonts, as it may cause rendering issues and a fallback font may be used. For example, Arial Black (one space) vs. Arial Black (two spaces). Avoid using the naming convention Font Name 1, or any combination with numbers. Adding multiple Google Fonts may increase load time. Learn more here.